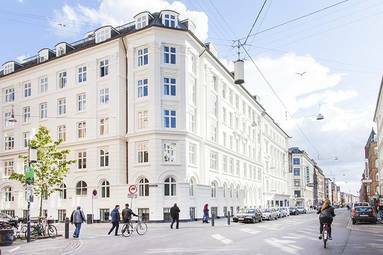 Absalon Hotel is a unique, modern yet classic hotel in the bustling central Copenhagen district of Vesterbro. The wonderful bedrooms are furnished with collections from the international home and lifestyle company Designers Guild, which are renowned for their beautiful colours and patterns. New and stylish bathrooms. Relax and plan your day in our beautiful and comfortable lobby lounge, and enjoy a cool refreshment or good cup of coffee. Walled garden with miniature golf.